"The decorative print is in rich green, brown, yellow, gold and orange on a cream colored jacquard background...machine washable for easy care." "A poly-cotton blend with a tight weave for maximum stain resistance. Each napkin measures 18” x 18”." "Made of stoneware, this crackle finish plate has a vintage charm to it and would look great on any autumnal table setting." "The DII pumpkin napkin rings are made from metal and come in a burnished bronze color — perfect for your autumn decor." "We love this all-in-one decoration that incorporates warm, rich colored fall foliage with three beautiful hurricane glass candle holders." "The classic white design is embossed with a turkey and scalloped edges...best of all it’s dishwasher, microwave, freezer and oven safe." "Lovingly crafted from imported glazed ironstone, and they're microwave and dishwasher safe for easy cleaning after your big feast." "Includes two sets of shakers (salt and pepper), so you can put a set at each end of your table...made from creamy white ceramic with gold crowns." "Set of 50 tent-style place cards...Each design has a hand-painted look and is printed on heavyweight card stock." Setting an elegant tablescape starts with your tablecloth. 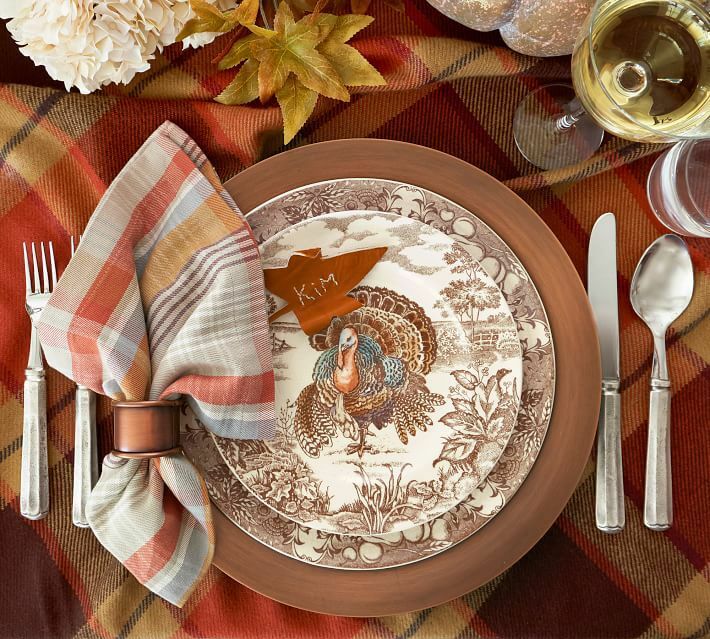 Your Thanksgiving day tablecloth should act as the perfect backdrop for layering all of your favorite festive ware. The Harvest Splendor Fabric Tablecloth by Benson Mills is the perfect pick for effortlessly dressing up any table. The border of the tablecloth is printed with gourds, pumpkins, Indian corn, wheat and so much more to capture the harvest spirit. And a large Thanksgiving day turkey festively adorns each of the four corners. The decorative print is in rich green, brown, yellow, gold and orange on a cream colored jacquard background. The Harvest Splendor tablecloth is available in four different sizes, to fit any table. And don’t worry if a little wine or cranberry jelly spills on this tablecloth, because it is machine washable for easy care. Add a touch of elegance to your Thanksgiving Day table with the addition of cloth napkins. This set of 12 dinner napkins from Utopia Kitchen is a poly-cotton blend with a tight weave for maximum stain resistance. Each napkin measures 18” x 18” and they are available in seven different colors, so there’s sure to be the perfect color to complement your decor. Durability and style are crafted into these hotel-quality cloth napkins so you can enjoy them season after season at all of your special occasion dinners. They are stain-resistant and machine washable, making them a practical and elegant accessory for your dining table. These cloth napkins from Utopia Kitchen have over 1,500 satisfied customer reviews, who boast about their bright colors, wrinkle and stain resistance and their soft, absorbent texture. If you're in the market for some Thanksgiving dinnerware this set from Pottery Barn couldn't be more perfect. Made of stoneware, this crackle finish plate has a vintage charm to it and would look great on any autumnal table setting. Pair it with white linen napkins or go all out with plaid, you really can't go wrong with these. At 10.75" in diameter, they're big enough to hold the main event but not so overwhelming that you won't be able to fit them on the table. If you already have holiday dinnerware, they also come in a salad size set, which is perfect for your famous apple pie recipe. If you are going to add cloth napkins to your tablescape, then you really need these adorable yet classy, pumpkin napkin rings. They will tie your autumn splendor theme together, make your guests feel special and, well, just look fall-tastic. The DII pumpkin napkin rings are made from metal and come in a burnished bronze color — perfect for your autumn decor. These Thanksgiving napkin rings come in a set of six. Customers who’ve purchased these Thanksgiving napkin rings boast of their sturdy construction, solid weight and quality. They add the perfect touch to any table. If pumpkins aren’t your thing, check out all of the other styles available from DII. They carry napkin rings for every holiday, from St. Patrick’s Day to Christmas, as well as basic varieties like simple gold or silver napkin rings. Impress your guests with this beautiful centerpiece. We love this all-in-one decoration that incorporates warm, rich colored fall foliage with three beautiful hurricane glass candle holders. Simply place in the center of your Thanksgiving table, and add votive or pillar candles for a touch of elegance. The clear hurricane glass holders are surrounded by autumnal fruits, berries, gourds, fall foliage, and twigs. It has a sturdy metal base, and it measures an impressive 30" x 10" x 19". After the holidays you can move this piece to the mantel or hall table for a festive touch. Everyone knows that the true centerpiece of every Thanksgiving table is a succulent, golden-skinned turkey. And you know that serving your culinary masterpiece on any old basic dish (or worse yet, straight out of the roasting pan) simply won’t do. Plate your pièce de rèsistance on this classic, timeless fine white porcelain serving platter from HIC. A 17.5” surface is large enough to hold a big bird and still leave plenty of space for carving or trimmings. The classic white design is embossed with a turkey and scalloped edges for an elegant addition to any table decor. This platter is versatile, elegant and best of all it’s dishwasher, microwave, freezer and oven safe. Add a colorful element to your holiday table with the Harvest Pumpkin Salad Plates from Pottery Barn. Boasting an intricate, watercolor-inspired design and autumnal colors, these salad plates are a far cry from your average serving dishes. They will delight guests and family members alike! The Harvest Pumpkin Salad Plates are lovingly crafted from imported glazed ironstone, and they're microwave and dishwasher safe for easy cleaning after your big feast. Best of all, these plates will coordinate well with any other dinner set (the colors are subdued enough), so you don’t have to worry about buying additional pieces. These are just the cutest...and they come in a set of 4! Season your meal and your table with holiday-themed salt and pepper shakers for the perfect finishing touch to an elegant table setting. The Kate Aspen set includes two sets of shakers (salt and pepper), so you can put a set at each end of your table, or maybe give one set as a gift. They come packaged in a fall themed kraft box with a clear viewing window and a natural twine bow on top of the box for ready-made gifting. The Kate Aspen Acorn Salt and Pepper Shakers are made from creamy white ceramic with gold crowns. Each shaker measures approximately 1.7” x 1.3” x 1.3”. They’re an adorable and festive way to complete your holiday tablescape. Adding place cards at each setting not only helps guests avoid unnecessary confusion but it is also the final touch to an elegantly dressed table. This set of 50 tent-style place cards is adorned with autumn florals and a pumpkin along with plenty of white space for writing in guests’ names. Each design has a hand-painted look and is printed on heavyweight card stock. You can use any pen or marker on these thick-stock place cards without worry of the ink smearing or leaking through the card stock. This large pack of place cards has a rustic charm that easily complements any table decor.